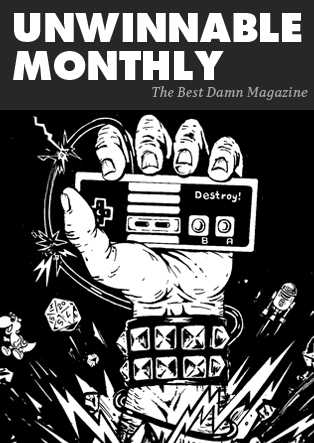 Each week, we here at Last Week’s Comics will be reviewing comics we read the previous week. They won’t necessarily be comics that came out last week but they may be advance reviews, or something we bought two weeks ago but didn’t get to right away or they could be classic comics we re-read because we wanted to revisit old friends. We can’t be held to 20th Century publishing schedules, people! So who’s still playing catch-up with their comics after the holiday season? I am, most definitely, even though the second issue of Batman: Creature of the Nighthas been burning a hole on my pull list since it dropped a few weeks ago. Issue #2 picks up some years after #1. We join Bruce Wainwright as he journeys through college and into adult business life, roughly late 1970s to early 1980s. Bruce is more emotionally stable, and he realizes he has some powers, so is taking advantage of them (his looks, his name and his money.) Bruce still has visions of Batman, but seems to be more in control of these dreams and how his dreams can control Batman’s actions. I won’t review this spoiler, but there is an interesting twist on how Bruce’s hubris really affects what Batman does. 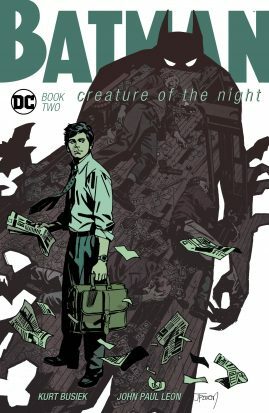 Batman: Creature of the Night is a book that rewards long-time Bat-fans with assorted winks and nudges (character names, Batman being a successful comic book property, Bruce Wainwright acknowledging – somewhat – that he can influence people by being a rich guy) but doesn’t get heavy-handed. Thankfully, our creative team doesn’t shy away from darker concerns, namely that the Batman of Bruce’s dreams is a violent being. He’s often depicted covered in his victims’ blood. Also, at times, his methods are questionable. Do the ends justify the means? Issue #1 of Batman: Creature of the Night felt like it could have been a stand alone tale, and issue two is equally strong. Writer Kurt Busiek shows he’s got a solid plan in place without hinting too obviously at what’s to come. He keeps things tense when needed and uses cliffhangers judiciously. Artist/colorist John Paul Leon continues to pay homage to David Mazzucchelli’s work from Batman: Year One, as well as depicting period fashion and hair styles well. His panels are detailed and he uses strong lines, but there’s no sense of overcrowding. The complaints I have are the same as I had with issue #1: the art runs into the binding and the cursive lettering used for Uncle Alfred’s dialogue causes an unnecessary slow down in my reading. I was really hoping we’d get to see the Reaper (from Batman: Year Two) but that was never promised, so I guess I can’t hold that against the book. I assumed we would see Bruce take the mantle of the Bat early on in this mini series, but I’m not sure that will happen at all. It may be for the better; Bruce will have to reckon with his hero – his id run wild – and he probably isn’t strong enough to do it. 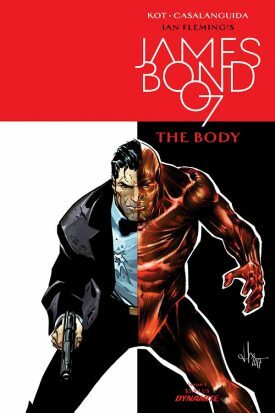 James Bond: The Body #1 didn’t click with me. Writer Ales Kot does something really different. The story begins with Bond in medical getting patched up after a mission. “What mission?” you ask. Well we’re about to find out in flashback via a conversation between the doctor and Bond. In a vacuum, this is actually a pretty interesting way to tell a story. However, here, it doesn’t really add anything. It might have been interesting for the doctor to go through each of Bond’s injuries and then for Bond to explain them. Instead, the doctor’s office is just a device. It’s not woven through the story in an organic way. While the characters have a conversation that makes sense and reads well, its not really necessary to the plot. Luca Casalanguida is an old hand at these Bond books I’ve been reviewing. It shows, in a really good way. There’s a “style” to Bond and that’s good. Overall the book reads cleanly and comes together nicely. While I think that the two threads don’t really connect in any meaningful way they are drawn together pretty well by the…well…drawings. I might call a few of the panels gratuitous but they’re all well put together and that’s what we need. Unfortunately, what this #1 doesn’t do that a number one should is give me a reason to pick up the next issue. I guess there’s a bad organization out there with ill intentions? The dual threads slow things down and don’t have the same “zip” or offer enough mystery to pull me into the second issue. The idea that Bond is being “dissected” sounds interesting but…why? Maybe others will find everything here brilliant or refreshing but I’m pretty cautious. It’s been a few years since I checked in with G.I. Joe. I loved the Chuckles arc in G.I. Joe: Cobra (if you haven’t read it, it’s basically a John LeCarre level G.I. Joe story). Fred Van Lente’s G.I. Joe series was a hoot and Max Brooks’ G.I. Joe: Hearts and Minds provided compelling character portraits of our favorite Joes and Cobras. When I heard Larry Hama was doing some fun and crazy things over in G.I. Joe: A Real American Hero, I decided I had to check in on my old pals, especially when I heard my favorite ninja commando was now a teenage girl! G.I. Joe: A Real American Hero # 246 and 247 provide a quick sitrep on the inside front cover, which is a relief because Hama and Diaz dive right into the lunacy. Snake Eyes died a about 30 issues back but thanks to Doctor Mindbender’s bungling, a teenage Cobra recruit named Dawn Moreno has been imbued with all of Snake Eyes’ memories. Issue 246 begins with a Tokyo amusement park full of dead Cobra Red Ninjas and two beat cops trying to figure out what happened. 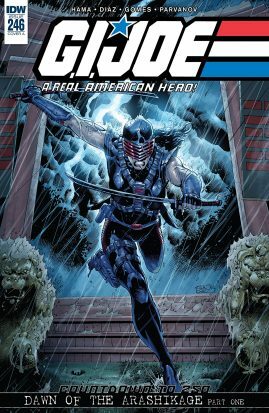 Most of this issue’s exposition comes from Inspector Harada, the Japanese government’s liaison to Snake Eyes’ old ninja-business pals, the Arashikage Clan. As they investigate over the next two issues, Hama flashes back to Snake Eyes’ time in Vietnam and also back to a G.I. Joe team mission. Dawn escapes the police as the Arashikage Clan watches over her. After the Red Ninja assassination attempt, it’s clear that Snake Eyes’ personality and memories in full control of Dawn. She’s on a one-girl mission to take down the Red Ninjas for good. The story is reminiscent of Snake Eyes’ ninja trance from G.I. Joe # 104. She’s single-minded in her goals. Her first stop? Pick up some guns from the local Yakuza. Her second stop? Evil ninja school (and from the next issue tease, maybe even the Baroness)! G.I. Joe: A Real American Hero is towards the 250th issue of Hama’s G.I. Joe comic. Hama and Diaz embrace the Direct to VHS action movie aesthetic of the 1980s comic without feeling dated. Dawn’s storyline feels like Robocop only with ninja business! While all the slicing and dicing is fun, I’m looking forward to Dawn getting back in the proverbial driver’s seat as the story progresses. I dove back and read some of her earlier stories and she’s a pistol of a character. Until then, I’ll enjoy the weird brainwashed violence and melodrama Hama’s G.I. Joe comics always deliver.